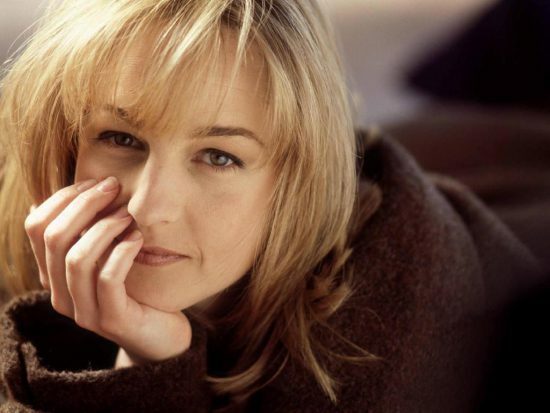 Actress Helen Hunt was born Helen Elizabeth Hunt on June 15, 1963 in Los Angeles, California, the daughter of Jane Elizabeth Novis and Gordon Hunt. Her father was of half German Jewish and half English descent. Her mother was of English ancestry. She starred in the sitcom Mad About You for seven years, and played single mother Carol Connelly in the 1997 romantic comedy film As Good as It Gets, for which she won the Academy Award for Best Actress. Some of her other notable films include Twister, Cast Away, What Women Want, Pay It Forward, and The Sessions. Hunt began studying acting at the age of eight with her father. She went to several plays each week as a child, and later practiced ballet and attended UCLA. She made her directorial debut in 2007 with Then She Found Me. In addition to her Oscar, Hunt has won four Emmy awards, four Golden Globe awards, and two Screen Actors Guild awards. She began dating Matthew Carnahan in 2001, and the couple had a daughter in May 2004. She was previously married to Hank Azaria. She is with the height 5 feet 8 inches in tall. She wears a size 9 shoe and her zodiac sign is Gemini. She is stepdaughter of B.J. Ward, Niece of Peter H. Hunt and Barbette Tweed. *She attended and graduated from Providence High School in Burbank, California. *She attended UCLA for 1 month. *She is of Jewish and English descent. *Celebrates Thanksgiving every year with Anthony Edwards. *Her best friend is Helen Slater. *She beat Teri Hatcher for the role of Jamie Buchman in Mad About You (1992) at the final auditions.